I’m super excited to participate in this HUGE Boxing Day Sale! You can use the code BOXING15 to get 30% off the patterns in the Designs by Call Ajaire Etsy shop. You can also enter to win one of the Bundles of patterns by commenting here on the Call Ajaire Facebook page. 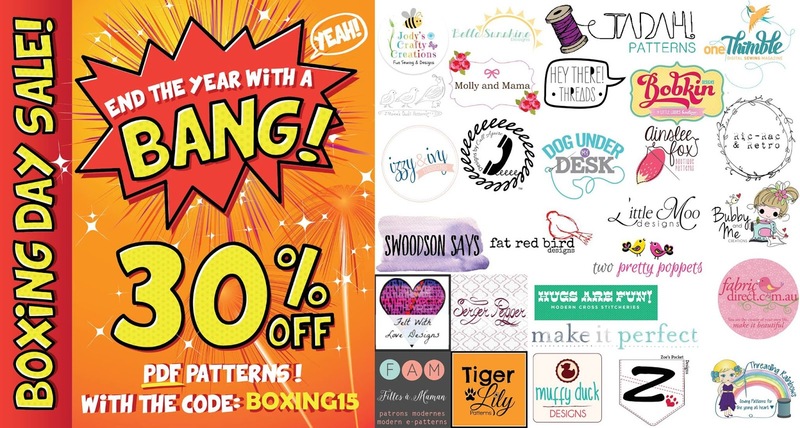 Running all day Boxing Day you can get 30% off your PDF Pattern purchases from ALL of these businesses with the code BOXING15. So by Boxing Day do we mean Boxing Day where you live? YES, Absolutely! The sale begins 12.01am 26/12/15 in Samoa and continues right through till 11.59pm 26/12/15 in Baker’s Island … it runs for 50 hours to make sure we cover Boxing Day world wide! So how long till it starts? Here’s a handy countdown! The Sale will begin http://goo.gl/hy9dHj and end http://goo.gl/qxJG4u. Good luck and Happy Shopping! !